I’ve written in the past about the hysteria surrounding student loans, and the focus in the media about how student loans are the next “bubble.” I recently published an op-ed in the Answer Sheet blog on education of The Washington Post in which I attempted to counter some of the rhetoric with facts about student loans. The piece received a number of comments, most of them critical, so I wrote a response which I expect to be published there sometime later this week. 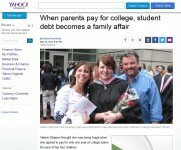 More recently, Yahoo published a story about one family in Massachusetts who had racked up more than half a million dollars in student loan debt, most of it in Parent PLUS loans, to send the first three of their four children to private colleges. I saw the article when a friend of mine posted it on Facebook, and after reading the story I posted a comment that said, “There is so much wrong with this article, I don’t even know where to start.” He followed up, and asked if I would be willing to explain my response in more detail. I did, and that response received many comments as well. So in the interest of sharing my response more broadly, I am including an edited version of my comments here. These comments will make the most sense if you have read the Yahoo article, so I hope you’ll take the opportunity to do that.